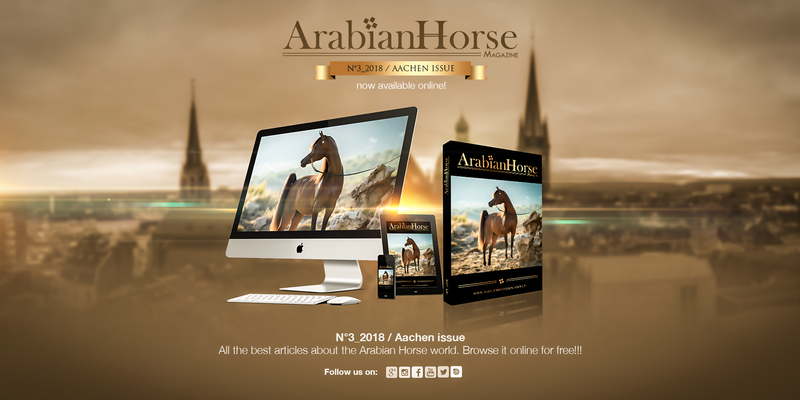 Make sure not to miss out the 2018 Aachen issue of Arabian Horse Magazine as it will bring you right at the very heart of the Arabian horse realm and its incredible stories. We will delve into the lives of some of the finest specimen of the breed with the likes of the multi-champion stallion Sultan Al Zobara, the super colt El Rey Magnum, the magic snow-white Excalibur EA, the statuesque ES Harir and the extremely gracious yearling filly SS La Bella that made a fantastic debut at the Menton show this year. 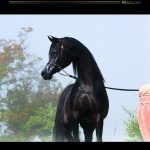 We are also happy to present in this issue the jewels form Dubai Stud like D Seraj Unanimous World Champion Yearling Colt in 2016, the well known and fascinating D Ajayeb that just has been named Gold Champion Junior Filly in Menton this year and the daughter of the World Champion D Shahla - D Shihanah that she herself just added an other Champion title as the Gold Champion Yearling Filly in Menton also this year. 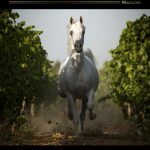 In this very special issue we have some beautiful articles like the wonderful history on Orrion Farm that we are very happy to show it to all of you, the El Nabila B one that his legacy is known over all, or on Mr Claus Bouché’s fine breeding program, not less interesting will be the wonderful article on the amazing and beautiful Eralda that is also in our cover picture and the upcoming superstar form Al Mazrouei, Flora LA form Brazil. So far, Arabian Horse Magazine crew has not skipped one single date on the Italian Show Tour 2018 under the lead of the Italian Association of the Arabian Horse which is more than half way through its course. We landed in Foggia, Apulia, for the 1st Puglia Arabian Horse Cup 2018; then flew up to north Italy for the European C – Summer Show in Montefalco, back to the south in Sicily for the C - European Show in Roccalumera to end up in Bergamo to join in the 6th edition of the Purebred Arabian Horses C Show. From its part, the international show scenery has offered to the enthusiasts of the breed across Europe many opportunities to catch up with long-term friends, be they breeders, judges, handlers, trainers or simply lovers, as well as the chance, often quite interesting, to start new acquaintances on the main shows; to exchange ideas about the latest trends in the industry of the Arabian horse, philosophizing as usual about ‘genotype’ and ‘phenotype’ to tackle the modern breeding concepts in Europe, in the U.S. and in the Middle East. Reason for which, we included quite some entertaining ‘bits’ of the most important international contests we put on schedule: the 3rd Spanish Arabian Festival 2018, the 10th National Championship of Palestine; the 12th mesmerizing edition of the Souq Okaz Festival in Saudi Arabia; the 15th Arabian Horse Weekend National C-show & International C-show in Manege de Pijnhorst - Sint-Oedenrode, The Netherlands; The Mediterranean & Arab Countries - Arabian Horse Championship in Menton on the glamorous French Riviera; the Elran Arabian Cup at Castle Alden Biesen in Bilzen, Belgium; the International B Arabian Horse Show in Vichy at Stade Equestre Du Sichon, France; and the AHO World Cup at the Farm Aprémont near Chantilly. Guided by our ‘educational concept’, we did not miss chance to interview breeder and judge Michaela Weidner, breeder Wendy Jane Delvalle, handler Malik Emanuel Morrison, photographer Gleen Jacobs, trainer Rod Jones and his wife Kimberley, all people who have pledged their life – to varying degrees or in different ways - to the Arabian Horse. 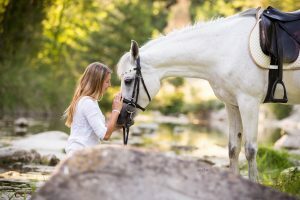 With that in mind, we sincerely think our Magazine can be a valuable handbook for the horse owner, both the novice horse breeder for which it can be a remarkable guide and the experienced one, as an educational reference volume about horse families, different breeding approaches and future developments of the breed. 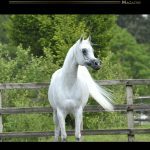 Illustrations and photos have been beautifully chosen with articles rich in stories about the Arabian horse, about the ‘people’ who live around them and for them, and who, thanks to this noble creature have found the meaning of life. A few ending lines to inform you that we will all be at the forthcoming show in Aachen. We expect you to come around to get to know each other by close and grab a copy of our beautiful publication.